EltaMd produces a variety of skin care products including the extensive line of EltaMd sunscreens of various SPF values that protect your skin from the harsh rays of the sun. So, here is a look at the most popular EltaMd sunscreen products, their benefits, features as well as user reviews. 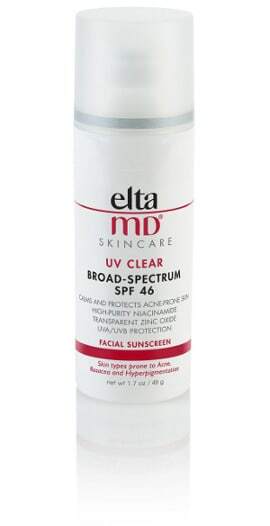 EltaMd UV Clear SPF 46 Sunscreen comes in a variety of sizes. It is a lightweight oil free formula that calms and soothes skin, protecting it from both UVA and UVB rays. This sunscreen goes on clear and absorbs quickly. Customers who have tried this product, find it ideal for acne prone skin also reporting that it goes on smooth, moisturizes and protects skin and doesn’t clog pores. Women users state it works well under make-up. The EltaMd UV Physical SPF 41 protects your skin against UVA and UVB rays. The protection in this sunscreen is provided by zinc oxide and titanium dioxide. This product is lightly tinted, water resistant and has a transparent finish. They state that it really protects their skin from the sun, however, some people find it to be drying. Some women use it as a light make-up base. 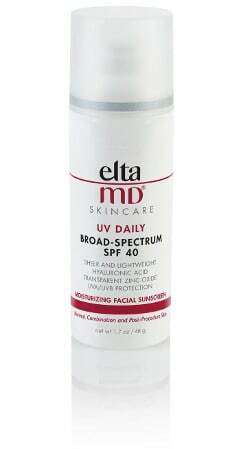 The EltaMd UV Shield SPF 45 Sunscreen comes in a 3 or 7 ounce container. This sunscreen product contains z-cote and is a non greasy formula. 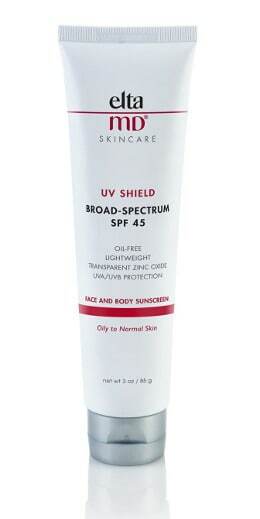 Designed for oily to normal skin, it protects against UVA and UVB rays. Users like that it goes on easily and smoothly, doesn’t feel oily and provides a thin layer moisturizer. They also find that this it is lightweight and exceptionally good for sensitive skin. The EltaMd SPF 50 Sport Waterproof Sunscreen comes in a 3 ounce pump container and is designed for those people who spend a lot of time out of doors. Great for athletes and children, this item provides intense protection from the sun and comes in a non-greasy formula. Users find that it goes on smoothly and offers long lasting protection from the sun, but also state that it doesn’t absorb well and can be difficult to wash off. EltaMd UV Daily SPF 40 comes in a 1.7 ounce container and is designed to protect the skin against UVA and UVB rays of the sun. It hydrates the skin and contains natural hyaluronic acids to help fight the signs of aging. It is fragrance and paraben free. This sunscreen is untinted and has a light feel. Users state that it doesn’t clog pores and leaves their skin with a healthy glow. Some users do suggest that this product might not be right for oily skin. 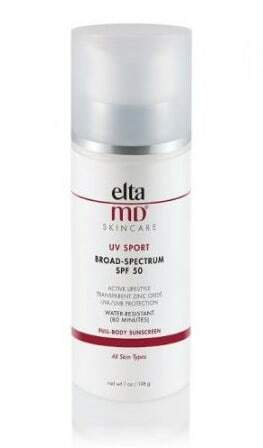 EltaMd SPF 30 Plus UV Facial Sunscreen comes in a 3 ounce container and provides good UVA/UVB protection. It is great for those with sensitive skin and can easily be worn under make-up. People find that although it goes on smoothly, it does feel a little oily to some of them and doesn’t provide enough moisture for those with exceptionally dry skin. Although users do like the texture of this sunscreen, they feel that it is a bit expensive. 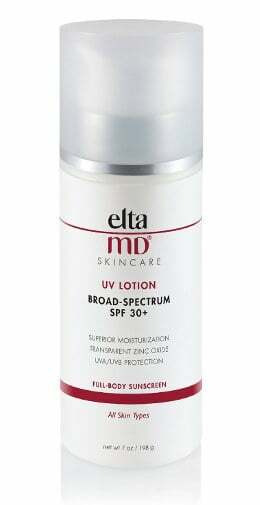 This Eltamd UV Lotion Broad Spectrum SPF 30+ comes in a 7 ounce container and is fragrance free. Not only does it provide UVA and UVB protection, but it also serves as a moisturizer. This sunscreen lotion goes on smooth and has no sticky feel. It absorbs well and doesn’t leave behind a white residue like many other sunscreen products do. Most users like it and feel that it does a great job of protecting them from the sun. However, few of them did experience a sensitivity to some of the ingredients in this lotion. 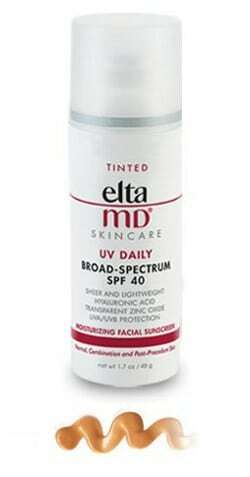 Eltamd UV Daily Board Spectrum is a tinted sunscreen that comes in a 1.7 ounce container. It protects the skin from UVA/UVB rays and is fragrance and paraben free. This product also uses hyaluronic acid to help fight the signs of aging. People say that it goes on smooth and has a nice texture. The light tint helps to even out skin tones, but in some cases the tinting can make the skin look orange. Users do state that this sunscreen provides them with protection, but also mention that some of the more powerful sunscreens by Eltamd provide better and longer lasting protection.